If you're extending because you've set your heart on creating a large open-plan kitchen extension, it's a good idea to start with its ideal design, before moving on to the practicalities of planning the extension, and considering the cost of a new kitchen extension. Planning the kitchen extension's design will allow you to consider how your life could be improved with a simple change of layout, the introduction of natural light and the addition of appliances designed to make your life easier. Follow the steps below to make sure your kitchen extension is designed and planned properly, and use our ultimate guide to extending a house to get lots more helpful advice and information. The amount of space you need for your kitchen extension will depend on how you plan to use it, so start here. There's no point in spending money on an extension that is too small; too big, and the room will be out of proportion to the rest of your home. Generally, the kitchen is the heart of family life and the room we spend most time in — cooking, eating, socialising, working and relaxing — and an open-plan (or semi-open-plan) space is often the best way to use the new extension. The key to creating the perfect open-plan kitchen is getting the space and the layout right first, before deciding on kitchen units, design details and decoration later. Find out more about how to design an open-plan kitchen extension to get the interior layout right. Read more below about designing a kitchen within an extension, but before you do, write a list of all the features that you already have in your kitchen, then add the features and appliances that you wish to add to the space. Are small kitchen extensions worth the investment? Planned carefully, a small kitchen extension can have a major impact, allowing you to rejig the layout of your existing space just a little to create a whole new room, with space for dining and living where once there might not have been. Our guide to side return extensions is a good place to explore how you might expand and extend sideways, like in the kitchen below; a small single storey extension (check our comprehensive guide on that, too) to the rear of the house can give you flexibility, too. The key is to get the kitchen's layout just right. If you’re looking to create an additional space for a large, open-plan family kitchen, the first step is to assess which area of your home will benefit the most from an extension. You could extend at the rear or side of your home to gain extra space; in a terraced house, a side return extension might be all you need to be able to create the kitchen of your dreams. In a townhouse, it may make sense to do a basement conversion, with a light well leading up to the garden. Extending to the rear of your property? No extension should overly compromise the garden, so try to find a balance between creating a workable space indoors and retaining as much outdoor space as possible. A good architect will help and advise with this, but if you're unsure, try to visit as many homes with extensions as possible to see what works, and what doesn't. Check out our feature on creating an indoor outdoor living space, too. Ideally, this transition should be as seamless as possible, something which can be achieved by good layout planning, and matching interior detailing and materials, including flooring and skirting boards, for example. How will you access the garden? The transition from inside your new kitchen extension needs to be as seamless as the transition from the original part of the house to the new room. This means putting exterior doors to the garden in a place that looks natural and is practical, both from inside and out. Bi-fold or sliding doors that lead straight on to a patio or deck will help you make the most of the indoor-outdoor relationship within the space, creating a more successful finish. Think about the visual transition between the two spaces, too. Whether you have swathes of fixed glazing or install folding sliding doors, ensure you situate them to make the most of the views of the garden. With its location, and access from inside and out sorted, consider how much glazing you want to include. This will help you make the most of light, but should be done in conjunction with planning your different zones for cooking, dining and living, plus any utility space, since the more glazing you have, the less wall space will be available. Consider the extension's orientation, too. If it's south-facing, you might want to consider limiting the glazing. Consider, too, how your planned extension will look from outside. Just as you might match the detailing and materials inside to those of the original house to create a seamless transition from the existing space to the new, choosing materials that match those of your home's exterior will make the new extension blend successfully. Or, perhaps you might like to site your new kitchen in a traditional-style orangery, or go for contrast, such as with a glass box extension, for a contemporary finish? 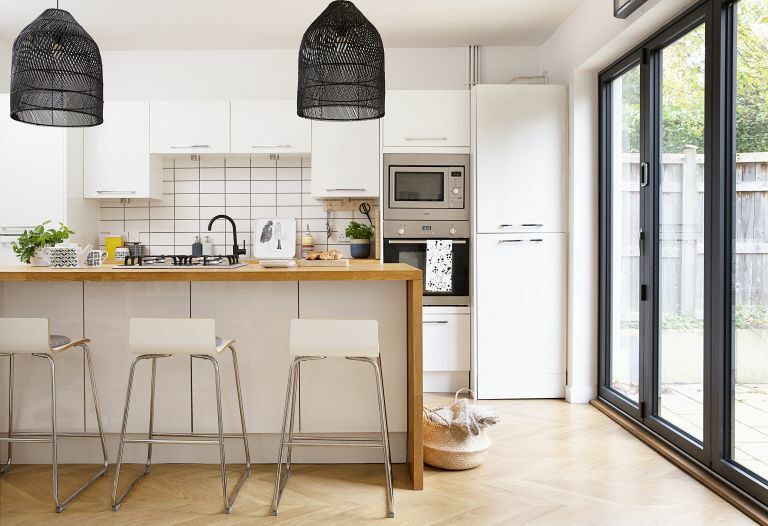 Once you have the space that you want designed, you can start thinking about the kitchen layout – our guide to designing a kitchen is a helpful starting point. It is worth consulting two or three experienced kitchen designers for their ideas. Make sure you give them a clear brief of what you are trying to achieve, but listen to their advice in terms of layout to suit the space, such as designing a galley, L-shaped or U-shaped layout, or introducing an island or appliance wall. Generally, though, it's best to site the kitchen towards the back end of the extension, nearest the original part of the house, with living and dining spaces nearer the brighter, garden end of the space. A good designer will understand the importance of function (ergonomics) and incorporate all the appliances you have specified. Once the basic layout is agreed, you can finalise details like the style of the units, cupboard doors and drawer fronts, worktops and splashbacks. You can also get down to final details, such as the sink and taps. Don't miss our feature on interior design know-how for kitchens to get these last details just right. How much is a kitchen extension? With plans in place, you can work out how much you can afford to spend on each element of your kitchen extension, and make alterations to plans if your budget won’t allow for certain design elements. Flooring will cost between £25 – £100 per m². Building regulation costs depend on what work is involved and the over all area of the proposed project, but expect to pay upwards of £200. Want more detailed advice on pricing your kitchen extension project? Check out our expert guide: how to cost your kitchen extension, and use our free extension cost calculator to get an idea of how much your project is likely to cost. Once you’re decided where you’d like your extension to be located, consult a RIBA-registered architect to find out what can be achieved. You will need plans and construction drawings for the builder, and to show compliance with building regulations. Find an architect at architects-register.org.uk or an architectural technologist at ciat.org.uk. If the work is classed as permitted development, you won’t need to apply for planning permission, but you may wish to apply for a certificate of lawful development, which proves the project is legal. If you do need planning permission, you will have to apply to the local council, and may need additional reports. Whichever route you are taking, you will need building regulations approval. It may be necessary to issue a party wall notice if you are building on or close to the boundary with a neighbour. With the plans in place, you can go ahead and find reliable building contractors to tender for your extension work. Consider personal and professional recommendations, as well as through trade bodies such as the FMB (Federation of Master Builders). Arrange to meet at least three contractors and, to obtain estimates, send them the plans, construction drawings and specification documents, plus the contract you want to use, so they can quote as accurately as possible.